Anastasakis, O. (2008) „The EU’s political conditionality in the Western Balkans: towards a more pragmatic approach“. Southeast European and Black Sea Studies, 8(4): 365-377. Bechev, D. (2004) „Between Enlargement and CFSP: the EU and the Western Balkans“, Paper prepared for the LSE European Foreign Policy conference, 2-3 June 2004, London School of Economics. Belloni, R. (2009) „European integration and the Western Balkans: lessons, prospects and obstacles“. Journal of Balkan and Near Eastern Studies, 11(3): 313-331. Bieber, F. (2010) „Constitutional reform in Bosnia and Herzegovina: preparing for EU accession“. European Policy Centre, Policy Brief. Diez, T., Pace, M. (2007) „Normative Power Europe and Conflict Transformation“. Paper for presentation at the 2007 EUSA Conference, Montreal. Elbasani, A. (2008) „EU enlargement in the Western Balkans: strategies of borrowing and inventing“. Journal of Balkan and Near Eastern Studies, 10(3): 293-307. Freyburg, T., Richter, S. (2010) „National identity matters: the limited impact of EU political conditionality in the Western Balkans“. Journal of European Public Policy, 17(2): 263-281. Grabbe, H. (2006) The EU’s Tranformative power: Europeanization through Conditionality in Central and Eastern Europe. New York: Palgrave Macmillan. Grabbe, H., “We’ve got to get the EU’s Balkans enlargement back on track”, Europe’s World, spring 2010 (Available at: http://www.europesworld.org/NewEnglish/Home_old/Article/tabid/191/ArticleType/articleview/ArticleID/21583/Default.aspx[Accessed 16 May 2011]. Hellman, J.S. (1998) „Winners Take All:The Politics of Partial Reform in Postcommunist Transition“. World Politics, 50(2): 203-234. Hyde-Price, A. (2006) „’Normative’ power Europe: a realist critique“. Journal of European Public Policy, 13(2): 217-234. Ker-Lindsay, J. 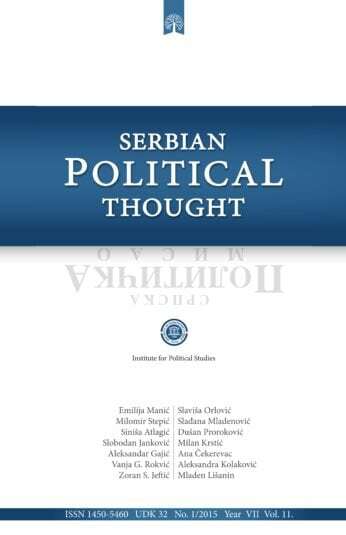 (2009) „From autonomy to independence: the evolution of international thinking on Kosovo, 1998-2005“. Journal of Balkan and Near Eastern Studies, 11(2): 141-156. Lerch, M., Schwellnus, G. (2006) „Normative by nature? The role of coherence in justifying the EU’s external human rights policy“. Journal of European Public Policy, 13(2): 304-321. Manners, I. (2002) „Normative Power Europe: A contradiction in terms?“. Journal of Common Market Studies, 20(2): 235-258. Manners, I. (2006) „Normative power Europe reconsidered: beyond the crossroads“. Journal of European Public Policy, 13(2): 182-199. Massari, M. (2005) „Do All Roads Lead to Brussels? Analysis of the Different Trajectories of Croatia, Serbia-Montenegro and Bosnia-Herzegovina“. Cambridge Review of International Affairs, 18(2): 259-273. Matovski, A. (2008) „Macedonia after Bucharest: avoiding another European failure in the Balkans“. European Union Institute for Security Studies, ISS Opinion, 13 June 2008. Merlingen, M. (2007) „Everything Is Dangerous: A Critique of ’Normative Power Europe’“. Security Dialogue, 38(4): 435-453. Missiroli, A. “The European Union: Just a Regional Peacekeeper?”. European Foreign Affairs Review, 8(4): 493–503. Mungiu-Pippidi, A., van Meurs, W., Gligorov, V. Plan B – B for Balkans: State Building and Democratic Institutions in Southeastern Europe. Berlin/Nijmegen/Vienna, 2007. Noutcheva, G. (2007) „Fake, Partial and Imposed Compliance: The limits of the EU’s Normative Power in the Western Balkans“, CEPS Working Document No. 274. Noutcheva, G. (2008a) „Enlargement policy towards Central and Eastern Europe 1989-2007: Normative Intended“, in: Tocci, N. (ed. ), Who is a Normative Foreign Policy Actor? The European Union and its Global Partners. Brussels: Centre for European Policy Studies, pp. 26-30. Noutcheva, G. (2008b) „Policies towards Kosovo, 1999-2007: Imperialistic Intended“, in: Tocci, N. (ed. ), Who is a Normative Foreign Policy Actor? The European Union and its Global Partners. Brussels: Centre for European Policy Studies, pp. 46-51. Nye, J. (2004) Soft Power: The Means to Success in World Politics. New York: Public Affairs. Petrović, M. (2010) „Investigating the limits of EU Eastern Enlargement: politics, geography or ’absorption capacity’?. Paper prepared for the ECPR Fifth Pan-European Conference, Porto, 24-26 June. Petrovic, M. (2009) „(What about) the Further Enlargement of the EU? In between European Enlargement Fatigue and Balkan Instability Challenges“. Australian and New Zealand Journal of European Studies, 1(2): 39-58. Rupnik, J. (2009) „The challenges of EU enlargement in the Balkans“, European Union Institute for Security Studies, ISS Opinion. Sahin, S.B. (2009) „The use of ’exceptionalism’ argument in Kosovo: an analysis of the rationalization of external interference in the conflict“. Journal of Balkan and Near Eastern Studies, 11(2): 235-255. Schimmelfennig, F. (2008) „EU political accession conditionality after the 2004 enlargement: consistency and effectiveness“. Journal of European Public Policy, 15(6): 918-937. Schimmelfennig, F., Sedelmeier, U. (2004) „Governance by Conditionality: EU Rule Transfer to the Candidate Countries of Central and Eastern Europe“. Journal of European Public Policy, 11(4): 661-679. Schimmelfennig, F. (2005) „The International Promotion of Political Norms in Eastern Europe: a Qualitative Comparative Analysis“, Center for European Studies at Harvard University, Central and Eastern Europe Working Paper No. 61. Sedelmeier, U. (2005) „Eastern Enlargement: Towards a Europеan EU? “, in: Wallace, H., Wallace, W. (eds. ), Policy Making in the European Union. Oxford: Oxford University Press, pp. 401-428. Sjursen, H. (2006) „What kind of power?“. Journal of European Public Policy, 13(2): 169-181. Tocci, N. (2008a) „Profiling Normative Foreign Policy: The European Union and its Global Partners“, in: Tocci, N. (ed. ), Who is a Normative Foreign Policy Actor? The European Union and its Global Partners. Brussels: Centre for European Policy Studies, pp. 1-23. Tocci, N. (2008b) „The European Union as a Normative Foreign Policy Actor“, in: Tocci, N. (ed. ), Who is a Normative Foreign Policy Actor? The European Union and its Global Partners. Brussels: Centre for European Policy Studies, pp. 24-25. Vachudova, M.A. (2006) „Democratization in Postcommunist Europe: Illiberal Regimes and Integration after Communism“, University of North Carolina, Center for European Studies Working Paper Series No. 139. Wallace, H. (2002) “The Council: An Institutionalist Chameleon?”. Governance, 15(3): 325-344.